Disney does it right. 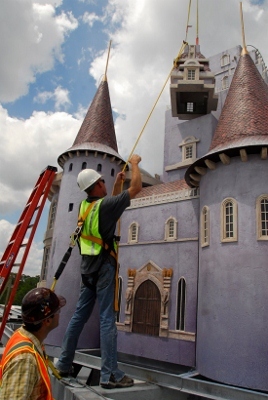 For years, theme park goers have found themselves amazed by the amount of detail Walt Disney Imagineering puts into creating new experiences for its guests. Everything from the line queues, ride vehicles, and walkways, to the background music, cast member costuming, and building structures are examined when creating a new area for a Disney park. With the recent grand re-opening of Disney California Adventure and the upcoming celebration of the completed Fantasyland expansion in Walt Disney World, guests will once again find themselves immersed in pure Disney magic. For those of out there who have frequented Disney parks many times in the past, it is safe to say that we become somewhat critical of the changes and advancements the company makes in its attractions and restaurants. We expect bigger and better experiences and are not shy of criticizing those that do not live up to our expectations. 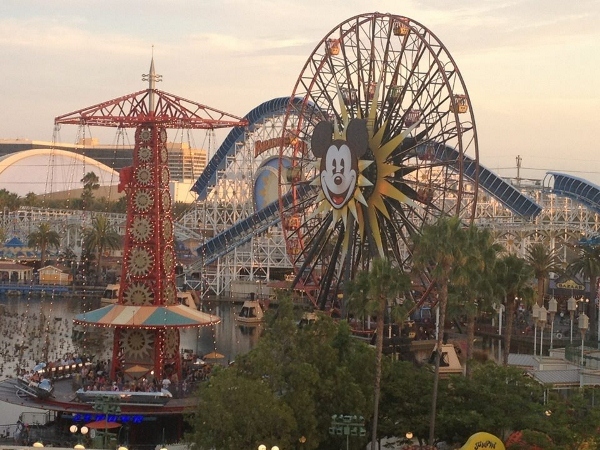 When Disney California Adventure first opened in 2001, guest feedback was less than positive. Many felt that the park relied too heavily on pre-manufactured rides and not enough of the magic Disney was known for. After $1.1 billion in improvements, the newly themed and updated park opened this past June and has received rave reviews from fans. Walt Disney Imagineering brought its “A Game” and unveiled new attractions, theming, eateries, and even a new land all sprinkled with the pixie dust we as Disney theme park fans have come to expect. When Cars Land first opened in the re-imagined Disney California Adventure, I have to admit, I was not overly eager to visit. Being more of a traditional princess-style movie lover, I wasn’t exactly thrilled to experience a separate land devoted to Route 66 and the Cars characters. However, I was completely blown away by the amount of thought and attention Disney Imagineers put into creating this new themed land. In anticipation of my visit, I made sure to give the film, Cars, another shot. Luckily for me, ABC hosted a special presentation of the movie with sneak peeks of the attractions and environment in the park shortly before arriving in California. Because this was my second time watching the film, I made sure to pay attention to specific artifacts and scenes that I knew would play a big role in Cars Land. For instance, I loved Radiator Springs at night. Who wouldn’t? Paying homage to the traditional tubular neon lights American roadways are known for, the skies shine in pinks, blues, and greens. The scenic drive through Ornament Valley definitely proved to be a sight to see. As for characters, Lightning McQueen was a cocky little fellow, and Mater definitely brought some laughs. All of these elements were bound to add some fun to Cars Land. 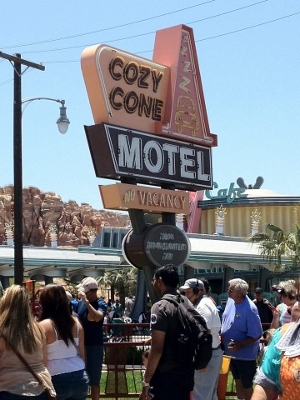 Image: Cars Land opened in June, 2012. 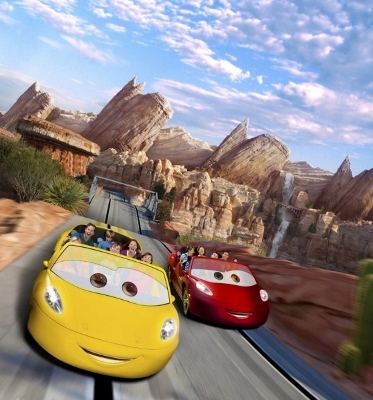 Once I arrived in Cars Land, I was stunned. I literally felt as if I walked into the Radiator Springs I first visited while watching the movie. I was a cartoon character! Everything I remembered from this sleepy little town was bursting to life right before more eyes. Luigi was selling tires, Fillmore’s psychedelic tent was brighter than the sky, and Flo was serving up grub to weary travelers. It honestly felt as if I became a part of the movie right then and there. This is Disney Imagineering at its best. Now that the highly anticipated Fantasyland expansion is preparing for its official opening this December, I have already been overwhelmed by the attention to detail shown in the areas that have been made public. 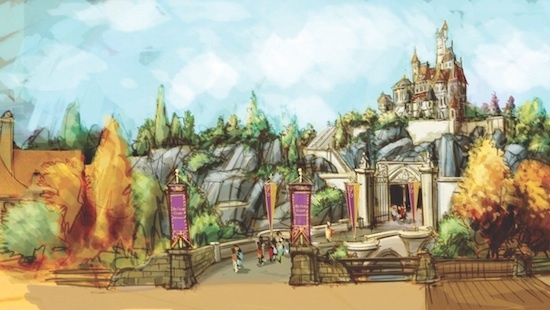 Probably one of the most impressive parts of the area will be Beast’s castle which has been designed to replicate the original from Disney’s Beauty & the Beast. The castle, set far back in the distance, towers above guests as they approach it. Built using a forced perspective technique similar to that used in many Disney attractions such as Cinderella’s Castle, the structure is actually quite smaller than one might have guessed. Forced perspective works in such a way that it acts as an optical illusion and thus tricks visitors into thinking the castle is much taller than the reality. This is accomplished by manipulating the size and scale of a building and then pairing it with carefully selected trees, shrubs, and other vegetation nearby. The result is unbelievable. Just think of how tall Cinderella’s or Sleeping Beauty’s castles appear. Truthfully, forced perspective acts as an illusion with these structures as well. 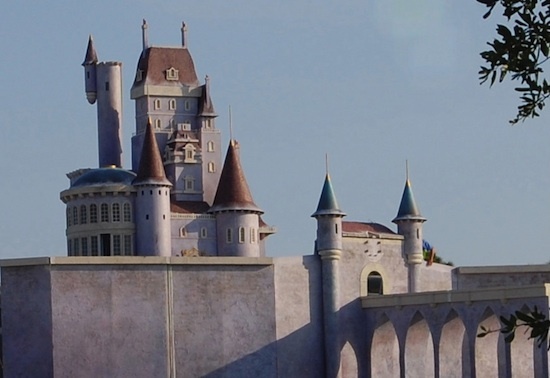 Image: Disney Imagineers used forced perspective to create Beast’s castle. In addition to the castle walls, what is nestled inside Beast’s lair is even more special. 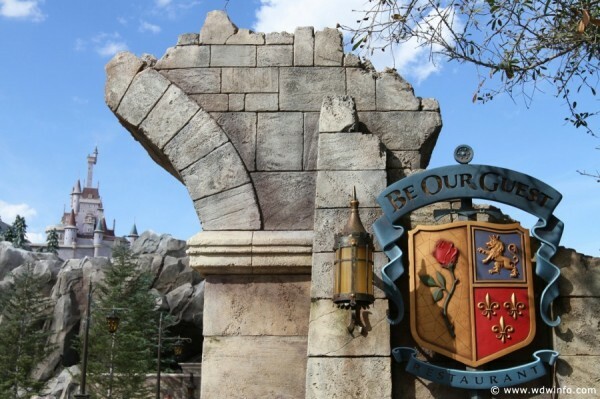 Be Our Guest Restaurant is sure to be a favorite among Beauty & the Beast fans and novices alike. Inspired by the song, Be Our Guest will feature quick service meals during the day and table service dinner experiences at night. Along with French cuisine, the restaurant in itself is an example of Disney Imagineering excellence. The space is divided into three areas: the elegant ballroom, glamorous Rose Gallery, and foreboding West Wing. 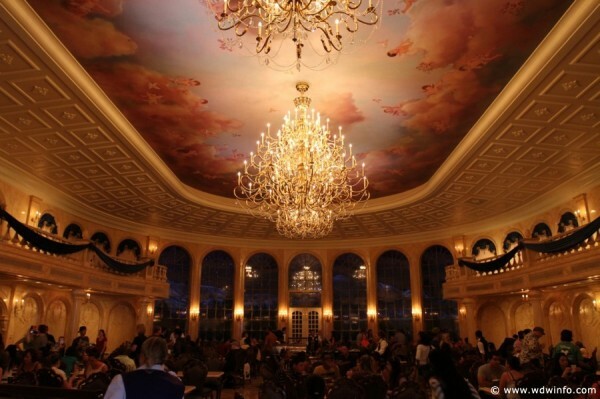 Inside each area, guests will find themselves fully immersed in some of the most famous scenes from Beauty & the Beast. The intricately detailed ballroom, for example, looks as if it fell from the screen and into our world. 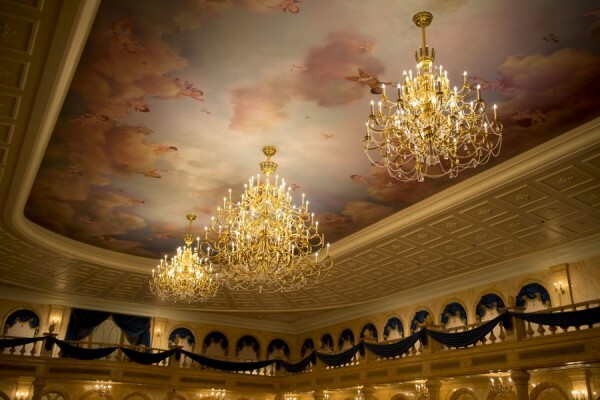 The lightly colored mural on the ceiling, dark draperies, and gold chandeliers will delight guests upon entering. 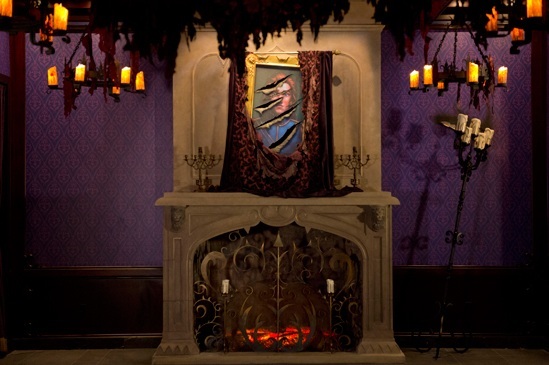 Those who dare explore the West Wing will watch as Beast’s portrait changes from human to creature as the petals fall from the enchanted rose. This whimsical flower can also be seen represented throughout the castle to heighten its importance to the story. Similarly, tapestries and paintings found in several locations inside the building showcase favorite characters and scenes from the movie. With just a few short weeks left before Fantasyland is officially open to the world, I can only guess as to what other surprises Disney Imagineering has for us. Under the Sea – Voyage of The Little Mermaid is sure to plunge us into the depths of the ocean. 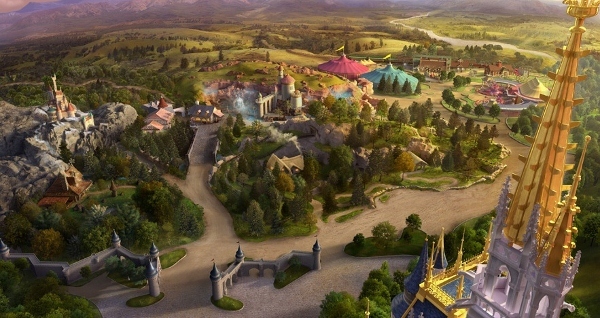 Coming in 2014, Seven Dwarfs Mine Train will catapult us deep in the mines of Snow White’s beloved friends. Along the way, I’m sure we’ll see even more magic as the new land is uncovered. We have already received just a taste of what the Imagineers will do before 2012 ends, and I expect to be blown away as time passes. Classic Walt Disney Imagineering is known for innovation. Only time will tell just how much the department can blur the lines between fantasy and reality. I know that I, for one, am looking forward to the ride.